Mattress pads add comfort and help protect your mattress. The Pillow Topper is an easy way to add comfort to any bed by transforming it into an extra soft luxury pillow top bed. Our wholesale pads and toppers are quilted to last longer and provide extra protection and comfort. 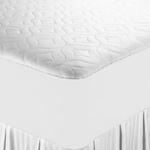 When spills or leaks are an issue, the Quiet Comfort Waterproof Mattress Pads are an excellent option to protect your costly bedding. 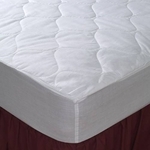 Ordering wholesale mattress pads can be very expensive if you have to pay for shipping. We keep things simple by paying all shipping costs, so you know exactly how much you're paying before you order. 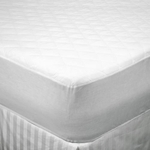 Questions about our wholesale mattress pads? Feel free to contact us for personal assistance.